Well, we're finally done! The Disneyland Matterhorn Bobsled, with little people in Mickey Mouse hats and Mickey T-shirts. Just waiting to add one final detail which will need to be done tomorrow, once everything dries overnight. We used these awesome Sharpie Oil-Based Medium Point Paint Markers and they were perfect. They're used like pens, but dispense glossy paint. Dries pretty quick too, if you don't lay it on too thick. Once painted it was time to work on the wheels. Because apparently, that's where the focus should be if you plan on actually winning the race. Now in years past, I just took the wheels, slid the screw through it and attached to the race car. But this year I got a real treat from a vendor of mine who holds the 2009 winning race car for his pack...oh boy. So I tried my best to follow his instructions. I sanded the screw for the wheels to take all the ridges off, so the wheels can spin freely. I also sanded the surface of the wheels so they don't wobble. I bought a Wheel Truing Mandrel Set for my drill, actually it's my dad's but hopefully I'll get one for my birthday. Hint, hint. This little gadget, holds the wheels in place, so you can spin them and hold the sandpaper up to it. Pretty clever, huh? Anyway, the wheels are supposed to be super smooth, and the screws super polished. I don't think mine are. Then we just assembled the whole thing together. 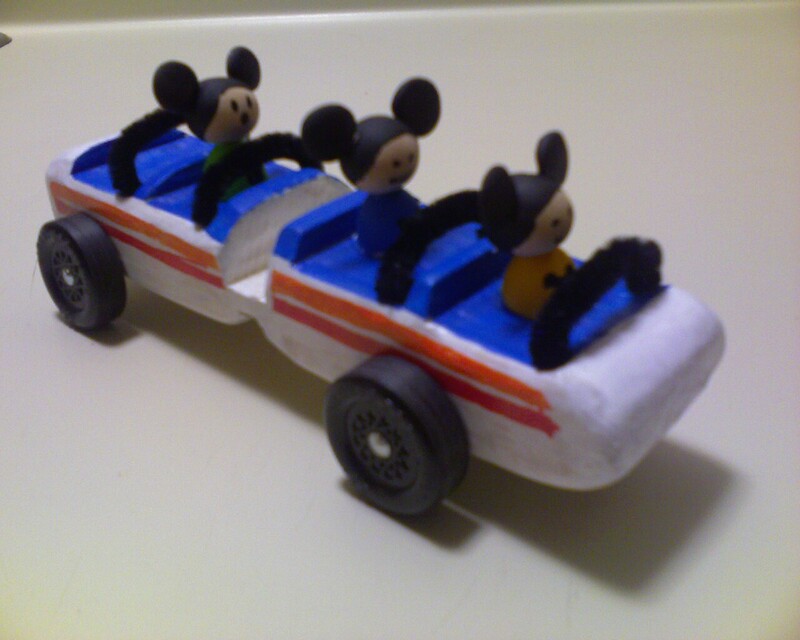 Glued the Disney little people on, and added the wheels. But something was still missing. The handles! How else are the little people going to stay in their seats through this ride? Then need handles to hold on to. So luckily, I had black pipe cleaners at home, cut those to size. And thanks to my dad's drill, I drilled tiny holes where the handles should be attached. Poured a dab of glue in them and inserted the pipe cleaners. Voila! So the race is tomorrow and I've done my creative something for the day. Did I say I like to cook too?